MINI Staples. Very simple and clean. All that white space. And using tire marks around the magazine staples to give a sense of fun and adventure. 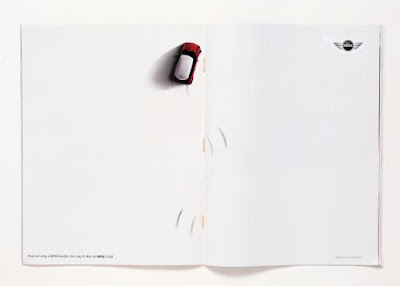 We've come to expect clever advertising from MINI. I'm sure MINI drivers appreciate this - clever people make, advertise and of course drive these cars. Part of a club. The tiny bit of copy at the bottom reads "Find out why MINI handles the way it does at MINI.com". Paul....do you like the ads Mini do?